I don't know much about baseball. Okay, I don't know anything at all about baseball. But, I do have a nephew that has played baseball since he was 4.I mean really, since he was a baby. Every single year. He is now starting his freshman year of college,and baseball is his life.I don't know much about baseball, and I don't really remember anything that he has tried to teach me over the years. The one thing that I do remember him talking about over and over is how his coach always wants him to pitch harder. Pitch harder? Seriously? I didn't even know there was such a thing.. I thought, you kinda, just "pitched". And that was that. But no, apparently that is not actually the case. Apparently, from what I am learning, this is a skill that can be learned, and you can learn to pitch up to like 90 mph. Umm, that is fast... And could really hurt. LOL. But, apparently this can also be a very good skill to have in baseball, and can make you really super successful! There are books on the subject, products to help you, it just goes on and on! I had no idea that you could even train yourself to pitch harder, or faster. I just kinda thought you had to work with what you had LOL! I really hope that my nephew can take advantage of some of these cool products that are on the market today so that he can do his very best at college and make his coaches proud! I know that he has the potential to be a very successful guy, and I hope that he doesn't squander that when I know how well he could potentially do! What do you guys think? Do you know much about baseball? If you do, I would love to hear your opinion on pitching products, etc.. What do you think are the best ways out there for my nephew to improve his pitch? I think he is really wanting to do his best since now at college, he realizes that this could very well be his future and he doesn't want to mess up a great opportunity like that! So, share your thoughts in the comments, I would love to hear them! This has been a sponsored post for Pitch Harder, however, all thoughts and views are 100% my own. My 17 year old is a senior lefty pitcher. He's pitched faster as he's gotten stronger. He pitches for a college travel team in the summer and will be playing for that college team next year after he graduates HS. 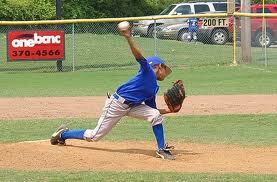 There aren't any miracle products that make a pitcher's velocity increase - just good mechanics and working out. He needs to make sure his rotator cuff and shoulder are strong. Good mechanics and strength help protect the shoulder, back and elbow from injury. I'm assuming he's been working with a pitching coach on his mechanics. My son's pitching coach has helped him increase his velocity by working on his release point and having proper mechanics when throwing. Good luck to your nephew! We live and breathe competitive baseball. Playing college ball is a big feat your nephew should be proud of accomplishing.